What is International Astronomy Day? International Astronomy Day was created as a way to provide a means of interaction between the general public and various astronomy enthusiasts. 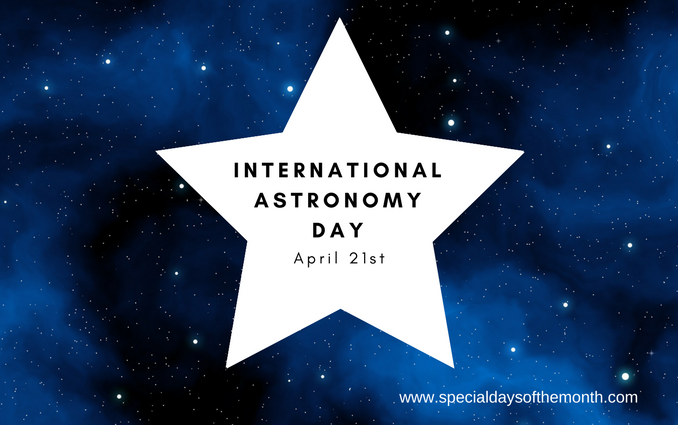 The unofficial holiday is an attempt to raise the interest of the general public in astronomy by giving them easy access to astronomical instruments such as telescopes, giving the public a chance to interact with astronomers and space scientists. When is International Astronomy Day? International Astronomy Day is celebrated every year on April 21st. How is Astronomy Day is celebrated? On Astronomy Day, museums, observatories, universities, and astronomy clubs set up easily accessible telescopes in public spaces including schools, parks, and shopping malls to allow people to observe the skies during the day and night. Celebrate by attending a local Astronomy Day event. Bring family and friends with you and spend some time gazing at the sky through a telescope. Celebrate the day by learning more about astronomy and how to study it as an amateur astronomer. Celebrate International Astronomy Day by participating in a little stargazing. Find a quiet, dark spot to look out onto the sparkling canvas that lies above our heads. Celebrate by taking children to a planetarium to observe various celestial bodies. Astronomy deals with the study of celestial bodies such as planets, stars, and asteroids as well as events such as eclipses and meteor showers. Astronomy Day was created in 1973 by Doug Berger who was the president of the Astronomical Association of Northern California. Astronomy evolved over the millennia to understand the history and science of earth and to understand the causes of celestial events. Until very recently, astronomy and astrology were seen as related fields of study. It was only in the 17th century that they separated ways. Light from distant stars take a very long time to reach the earth. When we look at a star through a telescope, we are looking at the light that left the star several hundred, thousands or even million years ago. On International Astronomy Day, many organizations offer the public the use of telescopes to experience the sights of celestial bodies that they have never seen before.